You started looking for tickets to “Wicked” months in advance. Not the cheap ones from the TKTS booth, but you wanted the pre-ordered dress circle tickets from the special credit card you hide for occasions like this one. After personally going to the ticket booth at the theatre twice when traveling on business and failing, and trying for the road show in Chicago, you pulled out your Ace. Your college friend is an agent in California and mentioned that you can call him, “if you ever need tickets.” This is the mulligan you’ve been saving up for twenty years. He gets you house seats, twelve rows back, center aisle. You pulled off a miracle and snagged tickets for “Wicked.” Kristin Chenowith and Idena Mendel are still bewitching audiences eight times a week. Academy Award winner Joel Grey stars as the Wizard. You’ve waited for months to see this show. Why is this one so special? You’ve loved everything about “The Wizard of Oz” since you were a child. Your family is distantly related to L. Frank Baum, who wrote the original Oz books, and you revere all that is Oz. The big day arrives and you settle into your ancient crushed velvet seat, “Playbill” in hand, the cacophonous sound of the pit orchestra tuning up heightens your excitement. The music rises and the curtain parts and the show begins. This past weekend I met my father’s girlfriend. My mother died last February after a long illness, the illness of dementia which took a toll on everyone in our family. My father provided hands-on, loving care for Mom for nearly seven years. After a two-year courtship and 57 years of marriage, my father struggled with being alone. In October he started dating several women from the retirement home where he lives in an independent apartment. The Girlfriend is a nice woman. She is attractive, funny, well-spoken, and engaging. She appears to adore my father, and they enjoy activities together. Like many women of the “Silent Majority” she is fine with letting him have center stage, while she often remains in the footlights. She is a dancer and teaches others to dance at the center. She also puts together shows, and takes dance lessons. This weekend she was practicing the foxtrot with a skilled dance instructor. My father always enjoyed dancing, and on New Year’s Eve she convinced him to dance at the center’s party. This is the perfect metaphor for women of that generation, and a perfect metaphor for my father and his friend. Both seem willing partners in this dance. From where I sit in the footlights, now it appears to be a good thing. While I loved seeing “Wicked” in the plush Gershwin theatre with its extraordinary sets and lighting, I was somewhat disappointed that I did not see Joel Grey. The show was wonderful, colorful and magical from our ideal seats almost on top of center stage but far enough away to consider the entire set. Like almost every evening I’ve ever sat in a darkened theatre, I did not want it to end. I came away wanting more. The play, indeed, is the thing. Family is much like the theatre. We are all given part in an original cast — for some it is the magic of a musical, for others it is the stonecold drama of an Arthur Miller play. Our scenes play on with tragedy and comedy, and the cast changes. Leading ladies come and go — actors leave the cast — the sets may change — eventually the play goes dark. Ben Vereen brought his own style to “Wicked” and I loved seeing him. And the play goes on. Some of the details in this essay were changed to make a point. 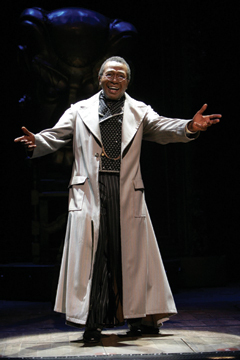 Ben Vereen joined the “Wicked” cast long after Joel Grey’s departure. I did see him in “Wicked” with the wonderful Rue McClanahan as Madame Morrible.